Efficiency and saving are two things that are valuable in the restoration of any muscle car. PST has made it easy to achieve both with our pre-assembled rear brake kits. 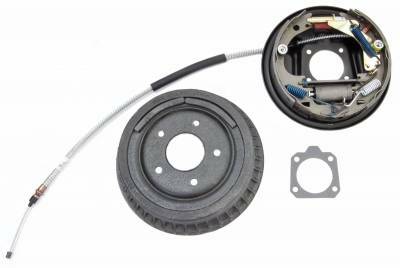 Our kit includes all new brake shoes, wheel cylinders, hardware and e-brake cable as a pre-assembled unit pre-mounted on the backing plate ready to install. Installation is easy with four mounting bolts, a brake line and an e-brake cable. It is then just a matter of adjusting the brake drum to the shoes and bleeding the brakes. Make the most of your time with a new kit today from PST. Splash shields are not included.